As the SUV continues its commanding presence in the US auto market, the new 2018 Honda Pilot full-size SUV has arrived to put the rest of the field to shame. Combining the engineering prowess at Honda with the styling and comfort to appeal to everyone, the new Pilot has it all. 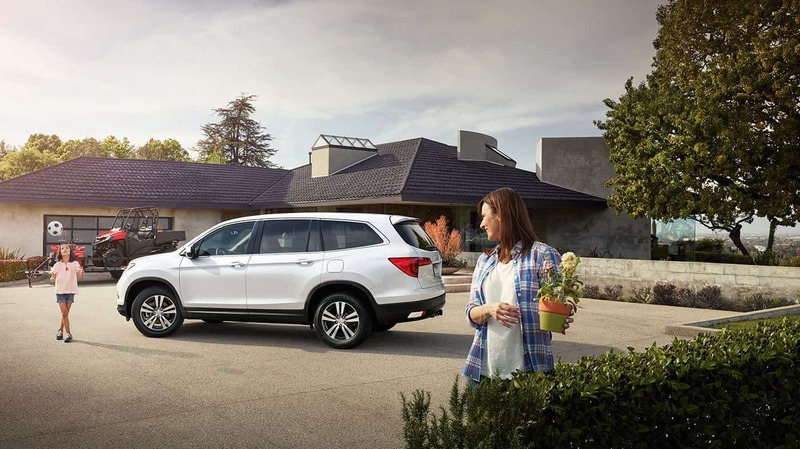 Convenient, useful, versatile, efficient, and more, the new Pilot is everything you could want in an SUV. Plus, it utilizes Honda’s deep reserve of safety and security systems, maximizing peace of mind for everyone. Come on down to Rock Honda in Fontana, CA and check out the new 2018 Honda Pilot full-size SUV today. Serving all of San Bernardino County, including the Inland Empire, Rancho Cucamonga, and San Bernardino, Rock Honda is ready to get you behind the wheel of the new 2018 Honda Pilot full-size SUV today. Come see us soon! Along with its rugged and eye-catching styling, the new 2018 Honda Pilot full-size SUV also has a host of features and options to serve drivers and passengers alike. Inside, interior features like head restraints at all seating positions, Bluetooth® streaming audio, A/C with air filtering, and Advanced Compatibility Engineering™ (ACE™) body structure help keep the new Pilot safe and inviting. On the outside, exterior features such as body-colored power side mirrors, rear privacy glass, automatic headlamps, and multi-angle rearview camera with guidelines are all standard fare in the new 2018 Honda Pilot full-size SUV. Come check it out today! The new 2018 Honda Pilot full-size SUV isn’t just styled to look competent and capable, it has the power to perform as well. At its core, the new Pilot is powered by the 3.5-liter V-6 EarthDreams® engine, providing output of 280 horsepower and 262 lb.-ft. of torque! Coupled with its seating capacity of 7-8 passengers (depending on trim selection), impressive cargo space, and ample towing capacity, the new Pilot can handle any adventure with you. Come on down to Rock Honda in Fontana, CA and check out the new 2018 Honda Pilot full-size SUV today!